I know Haemorrhagic Fever is hardly the wheelhouse of this blog, but infectious diseases come in many forms, and as several people have pointed out the current Ebola outbreak shows the inequalities and weaknesses of healthcare systems worldwide. Thus I’ll argue it fits somewhat within the scope of social determinants of health – especially as/when we finally get behavioural prevention measures. And in the end I’m a nerd for science and disease. Anyway, the below is a selection of pieces of interest that passed through my twitter account in recent days. The emphasis is on science, or articles highlighting science. The quantity of good, useful research on this outbreak is frankly stunning – lead by the rise of (new to me) PLoS Currents: Outbreaks – seriously, check it out. I know that I am both (a) missing lots of stuff and (b) going on forever, but this is just an attempt to gather my thoughts coherently. Comments/additions/subtractions very welcome. Reproductive rate (R0/Rt). There has been lots of work on this, unsurprisingly. Numbers fluctuate a lot, but not surprisingly the rate is estimated as highest in Liberia and lowest in Guinea. With all the rates between 1 and 2.5, which is promising for epidemic control at some point. Nice examples include work by David Fisman at University of Toronto (Fisman article), Christian Althaus at University of Bern (Althaus article) and Hiroshi Nishiura at University of Tokyo (Nishiura article). 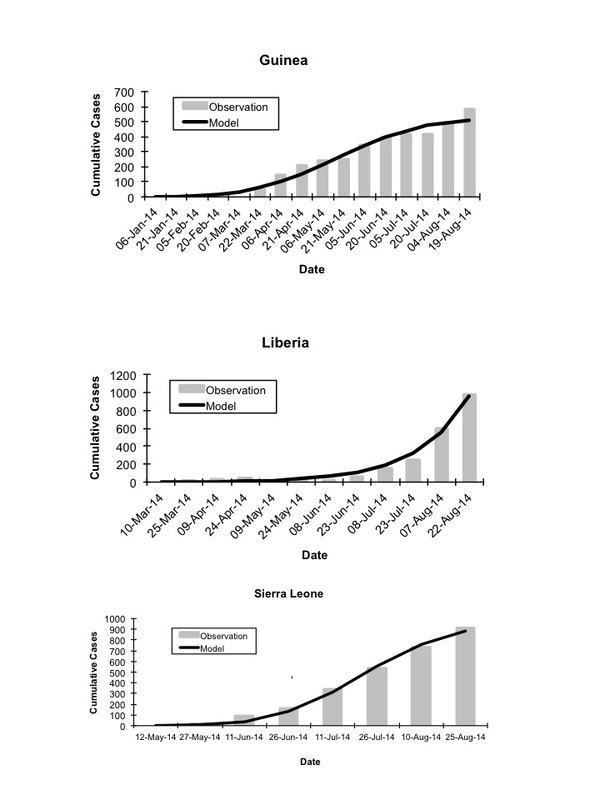 I particularly like Fisman’s figure of the national epidemic curves highlighting possible flattening for Sierra Leone and Guinea in contrast to the ongoing rise for Liberia. And Nishiura’s dynamic estimates of Rt, building on work by Laura White and Marcelo Pagano, whose HSPH course I was fortunate enough to take a few years ago. I would note that White and Pagano have a new method that is sensitive to spatial heterogeneity that might be very relevant to this outbreak. Predicted epidemic size. It’s really hard to predict final epidemic size when the epidemic is growing exponentially, since we don’t know when the growth is going to slow down. This has led to a very wide range of estimates for case and mortality numbers. The latest figures I have seen are via Nishiura’s Eurosurveillance paper, which gives a range from 77,000 to 277,000 additional cases by the end of the year. For me, the scary thing here is that the lower bound on this is still an order of magnitude higher than what we’ve seen to date. Very sobering. Oh, and another recent find (via Stéphane Helleringer) is this interactive, if short-term prediction model from Columbia University. Test your hypotheses to your heart’s content. Edit: I should note that Fisman’s projections without intervention are ~25,000 cases by the end of the year (and ~140,000 by the end of the epidemic in about 18 months time). So there’s still a lot of uncertainty on this. International mobility of human Ebola. Obviously much of the world’s most immediate concern is whether the epidemic will reach them. As many people have pointed out, in countries with strong health systems, even such introductions are unlikely to have anything more than minor impacts on health. 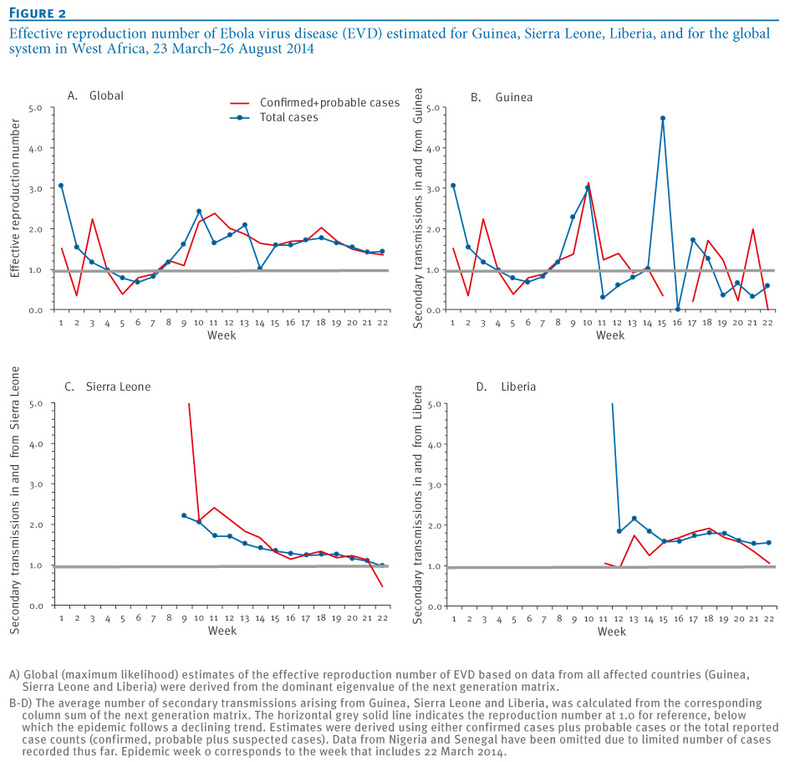 Marcelo Gomes, Allessandro Vespignani and colleagues at Northeastern and elsewhere – showed which countries are at highest risk of Ebola introductions in the near future. (Spoiler: Ghana, Nigeria, Gambia in West Africa; UK and US – but with lots of uncertainty – elsewhere.). My immediate reaction was to ask how much international travel is happening from Liberia, Sierra Leone and Guinea to anywhere else right now, and whether this model is using current rather than historical mobility data. The Methods in the article aren’t entirely clear on this, but I’d guess they are not building in the fact that right now the only foriegn places you can reach from Freetown are Conakry, Monrovia and on a good day Dakar, Casablanca or Brussels. I stand to be corrected, but regardless it’s a nice article setting up a structure for future analysis. (Gomes article.) I would also note the ongoing work of Flowminder on mapping within-West Africa mobility using cellphone data. This category still contains science, but usually being used push back against scare stories. It’s a pretty large category. And of course much of material in category 1 is needed to fight misunderstandings, such as border closures, flight bans and fear of touching anyone who has lived in Africa in the past year. Bushmeat. Source of scare: Newsweek. Twitter hashtag: #newsweekfail. Response: A rebuttal highlighting racism implicit and explicit: Washington Post opinion piece on the Monkey Cage by Kim Yi Dionne (@dadakim) and Laura Seay (@texasinafrica). See also this discussion on Scientific American and this podcast roundtable (long, behind paywall, but lots of good stuff in there) from Peter Tinti. On an important side note, bushmeat is often the source of the first case in an Ebola outbreak, but as a recent paper in Science notes, there was almost certainly only one transmission in this entire outbreak from animal to human. So, roughly 1 animal-human transmission to 5000 human-human ones. It’s not the bats we should be focusing on right now. Ebola as the Kardashian of diseases. Definition: Kardashian (n.) Famous for no good reason. A bit more detail: The idea that while Ebola is garnishing much coverage, it isn’t killing anything like as many people as diarrhoeal disease, HIV, Malaria, etc. Source of scare: Chris Blattman initially tweeted and blogged this. It was then picked up by the Washington Post. Response: Initially, a tweet by the aforementioned Stéphane Helleringer showing the potential impact of Ebola if it simply stayed at August rates of infection within Liberia. Subsequently expanded into articles in English (with the aforementioned Kim Yi Dionne) and in French in Libération (with Dionne and others). Unlike the other points in this section, the discussion was pretty amicable, with Blattman highlighting that his primary concern was around the stigmatizing impact of the only news out of Africa being about a scary infectious disease (cf Bushmeat, above). But the core messages from the responders appear to be: (i) “Africa is not a country”. I.e. Ebola is serious in a subset of countries, so although across Africa HIV and Diarrhoea are worse, in Liberia they may not be: and (ii) “exponential growth”, so although at the time Ebola was small fry, if it reaches ~300,000 people (see above) and kills ~240,000 (see above), then we are starting to get into the same territory as some of the more pressing causes of death out there. Airborne transmission. Source of scare: New York Times, perhaps set off by research in Scientific Reports from two years ago that showed in a lab the ability to pass Ebola from pigs to primates through the air. Response: this is the most recent scare, and the science community is getting better at marshaling its forces, so there was a response on Time within the day based on NIAID (National Institute for Allergies and Infectious Diseases) director Anthony Fauci’s press-conference. There were also blogs up rapidly from Healthmap (again) walking people through the lab trial, and viriologists such as Ian MacKay at ViriologyDownUnder pointing out that virus evolution is generated by selective environmental pressure, and there’s no clear reason why Ebola needs to go airborne to achieve some extremely nasty results. You may notice one large section missing here – how do we stop the epidemic? There have been some suggestions, such as: close off the slum with many infections in it (West Point Monrovia, two weeks ago); bring in military resources (MSF, USG, last week); or stop all inter-house movement for three days (Sierra Leone, next week). But I haven’t seen any science on the topic, and relatively little considering how individual-level rather than top-down behaviour change might play a role. I know that behaviour change interventions are being implemented by NGOs on the ground, but it is unclear how much these interventions are informed by the specific problems raised by Ebola or if they are informed by past research – not least because such low-level preventative work gets very limited coverage (welcome to the world of Public Health, where treatment >> prevention most of the time). One thing that immediately pops up on the Google is this Ebola Resource document (via Comminit) from Health Communication Capacity Collaborative based out of Johns Hopkins. Not immediately clear how solid this is, but at least it’s a start. Anyway, that’s far more than enough for now. More to follow if I get organized enough next week. And please do point me towards important articles or conversations: I’m @harlingg. This entry was posted in Ebola and tagged ebola, research, roundup, science, west africa. Bookmark the permalink.